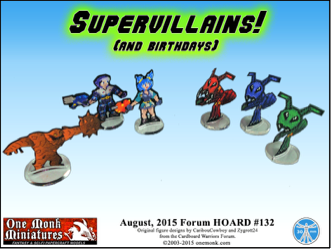 Forum Hoard #132 - Supervillains & Birthdays! Can Jet Force defeat the combined might of Clayface and the drone horde? Take it to the tabletop and find out! I know it's a bit late, but here's the August 2015 Cardboard warriors Forum Horde! Dark Terrors - Forum Hoard #133 - Released! My thanks to cariboucowboy for the figures and thanks to mproteau for the layout, cut-files, and photo assistance.